I think this is a great head start for holiday gifts! If you're like me, you have grand ambitions at the beginning... then next thing you know, you're frantically knitting till the deadline! I'm thinking about doing a Cesario for my brother. I think he'd like one in a solid blue or black. Do you have any thoughts on which pattern you'd like to work on? I hope to have you join me in this KAL! I think it will be a lot of fun! 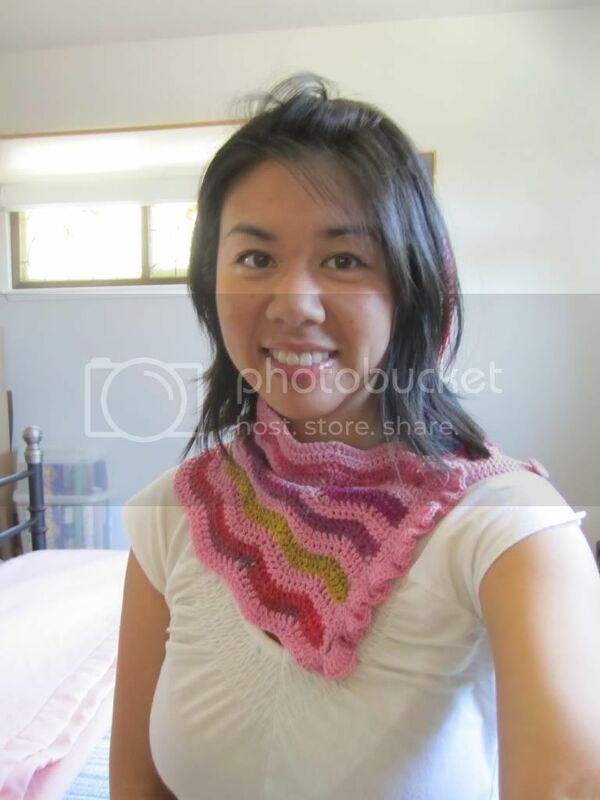 - one self published pattern by norichan knits of your choice. - one copy of my next self published pattern (scheduled to be published mid to late Nov). And who knows... in the next two months, maybe a few more prizes will be thrown in! As I'm finishing up writing a pattern, it`'s nice to have some "mindless" projects going, as well. This one is a great one as it's got lots of things going on, so it keeps me entertained, but because it's been a well written pattern so far, I haven't had to actually think about what I'm doing other than following a chart! The pattern is called Seeds to Flowers by Kristina Vilimaite. It is the July KAL that we are doing in the MegaKAL group created by myself and myusic. I am planning to do a KAL for Aviary Cowl in the fall (the wait is primarily due to a big move interfering with life right now). However, I know some of you much be itching to cast on for something cozy and warm right now with the crazy weather that's been going on lately! I finally managed to settle on a color for my Consummate V's Hat that I'll be knitting along with my KAL! I decided on Malabrigo Rios in Candombe! It's such a pretty colorway, I can't wait to get started on it! Have you chosen your yarn for the KAL? I'd love to hear or see what you've chosen! I am so excited to announce that I have created a group for people to join on Ravelry for pattern help, see recent releases, test knits I may be running, and KALs! Please join and get involved! To kick things off, I'm having a KAL with giveaways for my free Consummate V's Hat! - One of my self published patterns, winner's choice. - or enough yarn to make my next self published pattern (which will be published at the end of this knit along!) 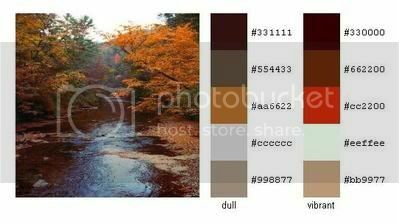 in either of these two colorways. <3 picking out sets for these kits! It's so much fun. My supplier is trying to get a final headcount, so please let me know in some manner if you are interested! I currently have about 10 people committed, and would like to give out 3 prizes! That means great chances for these people... I'd love for more people to commit so that it's a little more exciting. It'd also be a bit more fun and games for everyone if we got more people involved. :o) Thanks for checking this out! In the month of October, a design of mine will be used for a KAL/CAL! 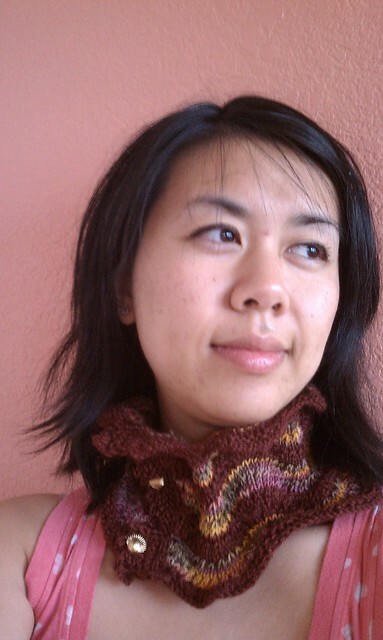 I am teaming up with Bohemia Fibers for a fun Cowl-Along. She will be dying up 2-50g skein sets in coordinating colors to go with my cowl design. 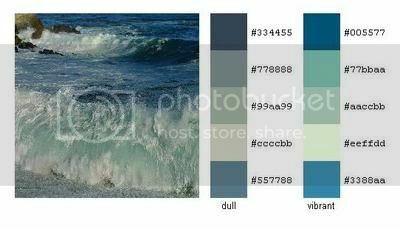 The color themes she has right now are: Fall Colors, Sea Themed, and Bohemia Wild and Crazy Colors. The cowl is pictured below to show what it will be like. 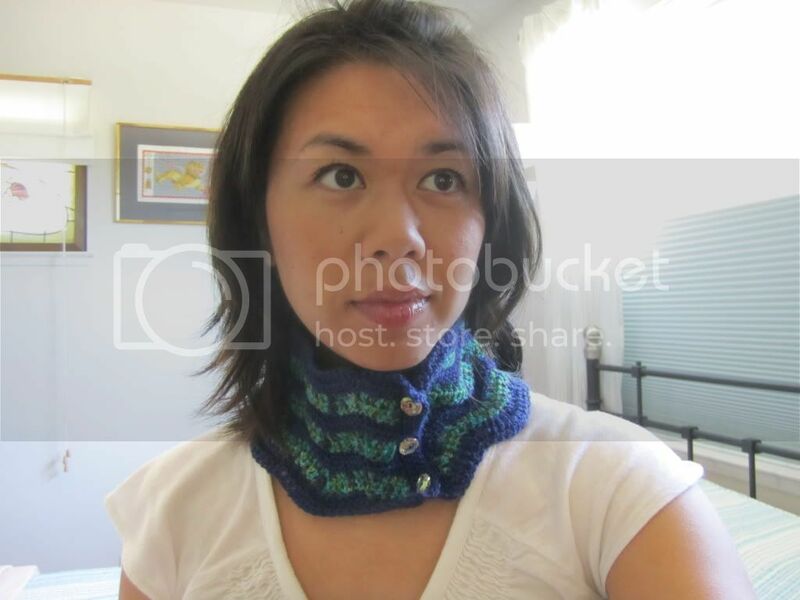 The cowl will come in 2 sizes in both a knit version and a crochet version. The cowl is buttoned closed, and the edging will come with 3 different instructions (maybe 4!) to give you the option to fully customize it. 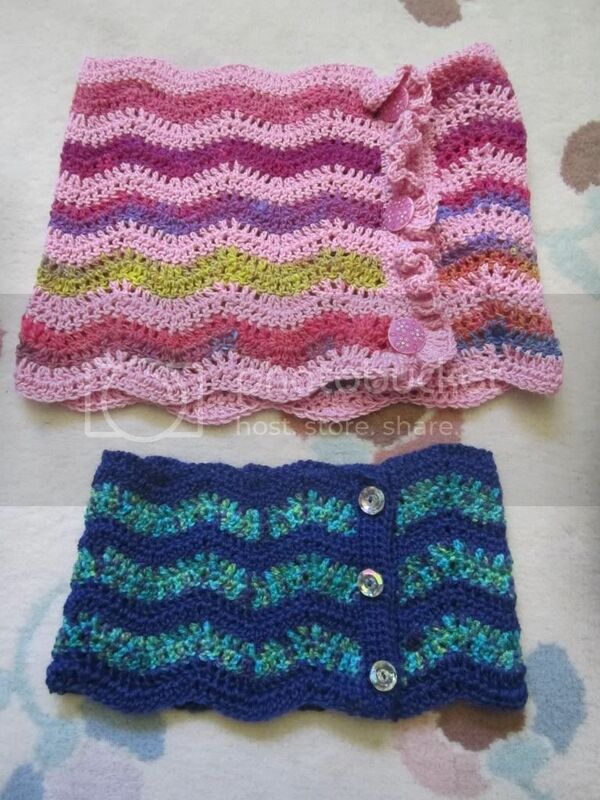 The edging options will include: ruffles, picot (with instructions on how to add beads with this option), and plain (best if you love your buttons and really want the buttons to stand out). While it may be hard to see, the cowl does have a slight gradation in size, smaller at the top and slowly flaring out at the base. 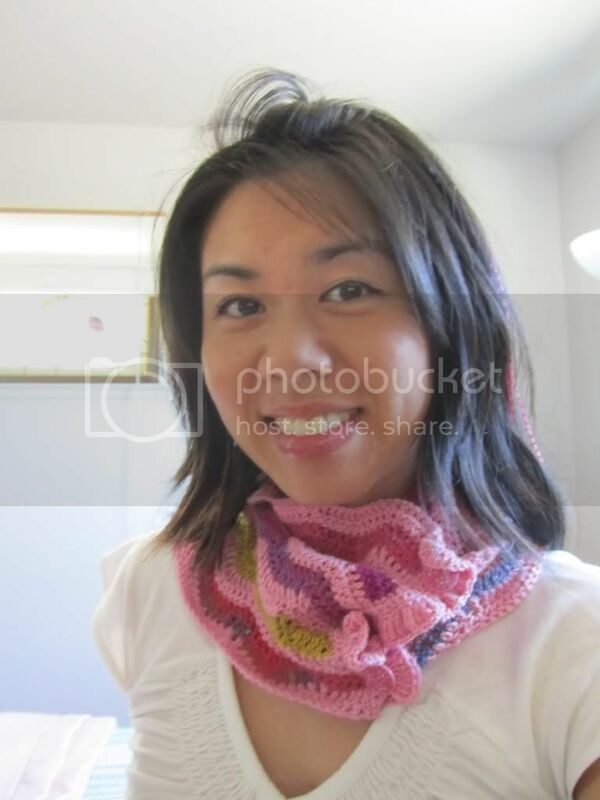 Here is the large sized cowl in crochet form with a ruffle edging work. An alternate way of wearing the cowl. The small crocheted cowl with a plain edge. To show you the difference in the two cowl sizes. If you couldn't tell while being modeled, they are drastically different sizes. The larger one is meant to be more of a drapey and scrunchy cowl, while the smaller one has less bulk so it's easier to wear with a coat on and is more cozy. 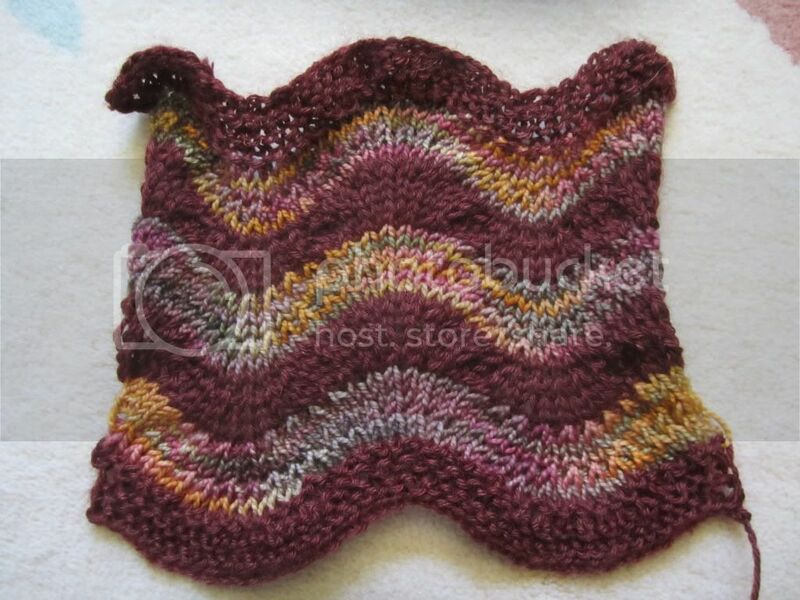 I have not finished a knitted version of the cowl yet, but here is a swatch to show you what it will somewhat look like. Amy of Bohemia Fibers would like to get a rough estimate of the number of people joining the KAL/CAL so she can get an idea of how much yarn she will need to order. I would like to make this easy on her because we both hate the idea of ordering too little and people being left out, but ordering too much is definitely difficult... especially if we do decide on the cashmere/silk yarn. So, if you could either message me here or on ravelry (Rav: norichan), that would be greatly appreciated. If you are on Ravelry, feel free to join our discussion here! You will not need a ravelry account to purchase a kit. Kits will not need to be purchased yet, just need an idea if you'd like to participate. Thanks! Oh! And before I forget... Yes! There will be prizes! Handspun yarn, free patterns, chocolate, and more are all possibilities for prizes!